The brown ale kick shows no sign of abating, at least not in the immediate future, especially given my next homebrew project is to make another batch of my own nut brown ale. What seems like an interminably long time ago these days, Mrs V and I went for a weekend to Williamsburg in 2010 to mark our 5th anniversary of meeting in a boozer in Prague. Williamsburg was the colonial capital of Virginia, home of the College of William & Mary, (yes, the Glorious Revolution William and Mary), and all round delightful little place to visit for history nerds like myself. We also took some time to head out to an industrial estate and try the beers from Williamsburg Alewerks, these days simply known as Alewerks Brewing Company. wonderfully smooth and tasty, a great beer for sitting on the balcony in the autumn chill and just watching the sun go down over the turning leaves. Once again the leaves are turning, and while I didn't sit on the deck, I did sit looking out over the deck to the woods at the back of my property, past the garden where the chickens are making a wonderful stab at eating the weeds and clearing out the raised beds. Anyway, on to the beer itself, which was a couple of bottles stashed at 54°F for a few days. Poured into my Timothy Taylor pint pot, perhaps my current favourite glass. 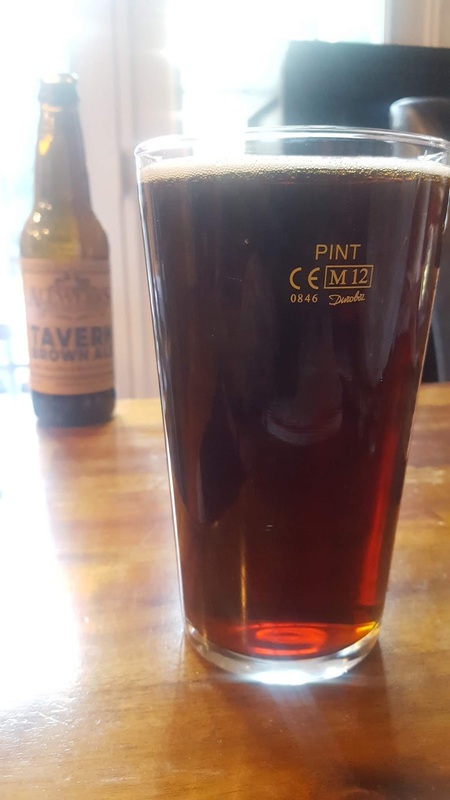 The beer was a deep garnet, with flashes of dark copper around the edges, the small, tan head dissipated rather quickly, and I have to admit that at one point I didn't think I was going to have much foam in the glass at all. The aroma department was dominated by tangy sourdough bread, unsweetened cocoa, and hazelnuts, there were some traces of toffee and caramel, but not much going on hop wise. The bready, nutella theme carried on when drinking the liquid itself, with some added caramelised oranges and spicy hop bite that reminded me of cinnamon chucked into the mix for good measure. 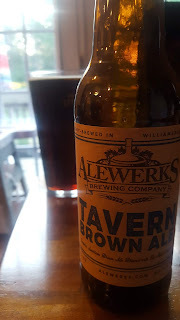 I thoroughly enjoyed Tavern Brown Ale again, and I think pouring it at 54°F as opposed to the usual chill of a beer straight from the fridge accentuated the complexity, making it a more pleasurable drinking experience. 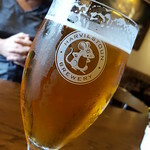 The word that kept running through my head as I drained my pint was that this was a "satisfying" beer, complex, balanced, and moreish, the kind of beer that you thoroughly enjoy drinking. It may just have made itself a front runner to be the Fuggled Dark Beer of 2018. Thanks for the tips on this one. 54 degrees will be my marker when I try this one. Great post!